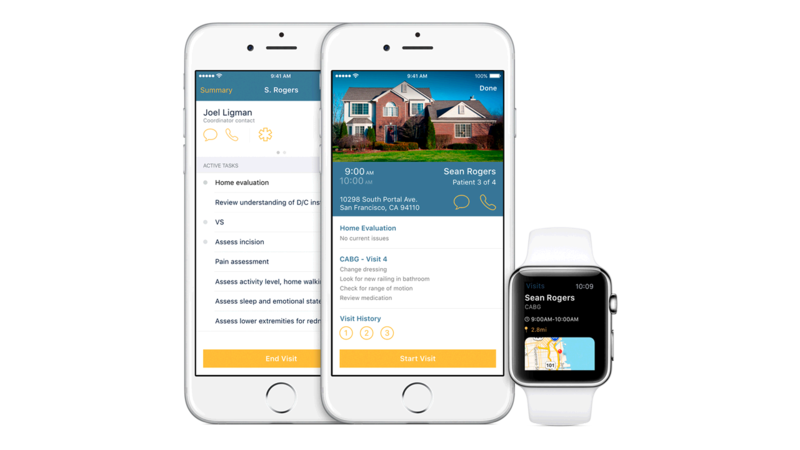 IBM MobileFirst for iOS Home RN connects home nurse schedules to care plan tasks, patient data, appointments, doctors, maps and care facilities. IBM MobileFirst for iOS Home RN gives in-home nurses one place to manage patient care visits and information. Scheduled patient visits show as cards on an area map or within an agenda. Patient information links to aftercare plans, discharge instructions, general care practitioners, specialists and historical data. Automated prompts, task lists, integrated GPS, text, audio, phone and photo reporting help nurses deliver more efficient home healthcare. A home page map of Visit Cards shows your agenda by patient visits, linking to records and GPS, phone, text and FaceTime. As you proceed through care plan tasks, your notes, photos and videos sync to the electronic health record (EHR) system so future nurses are aware of issues. Call doctors, hospitals or pharmacies to update information, order tests or check on prescriptions, and use Maps to find and add pharmacy pickups to your schedule when necessary. Review, update and add voice notes to visit cards using your Apple Watch so you can use both hands while caring for your patient.